Pittsburgh Councilwoman Darlene Harris filed with the Allegheny County Democratic Committee’s endorsement for the Mayoral primary. Current Mayor Bill Peduto has also filed for the the endorsement. Harris originally filed her letter of intent on February 3rd, along with Reverend John Welch and Peduto. They had until February 10th to pay the filing fee and to remove their name from consideration. Peduto has held office since 2013. 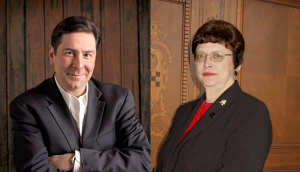 Peduto also served as a Councilman from 2002 until he was elected Mayor. According to the Pittsburgh Post-Gazette, Peduto had over $640,000 on hand as of 2016 for his re-election efforts. Harris served on the Council since her first election in 2006. Harris served as Council President from 2010 to 2014. On February 10th, only Peduto and Harris filed to continue through to the endorsement process. The endorsement meeting will take place on March 5th. Hey, wait a minute! What’s this about an audit at the sewer and water authority? We don’t need no stinkin audit! Somebody is going back on the list here. What we need is another half billion dollar bond issue, that will take care of everything. La Familia will see to it, Uncle Charley says. There’s nothing to see here. Move along. Move along. Sure, let’s frack Frick Park? That would give both Frick and frack to Pgh. How does Harris feel about fracking? Peduto has been clear in his fights to preserve the people’s rights against well-heeled and well-connected frackers. Might this primary become a referendum on fracking? Bill Peduto has really been a breath of fresh air for us. I am happy that mayor Luke did not suffer legal consequences, but he was not ready for the job. Things work out. Peduto waited and suffered and then when given the opportunity, he has shown his leadership skills. I would rather be living in Pittsburgh than any city in pa and almost any place in the country. Peduto should win in a walk, but being challenged is never a bad thing especially in a one party town. You mean they allow elections now in the Soviet Republic of Allegheny County? I will be supporting the incumbent mayor for the Democratic endorsement for reelection in 2017. Harris honestly isn’t even a real Democrat. She consecutively says racist and homophobic things throughout council meetings and doesn’t understand how a 21st century city is supposed to be governed. Okay, the godfather says that we are stuck with this oink because the Wagners ain’t up for another try. So, we gotta start the arm twisting to take out Big Fart and get back to making money. we have bond issues to write, utility lines to service, authorities to privatize and the City sewage and water properties to rebuild. It’s been 10 years since we redid 300 million in bonds there and they are ripe for another pluck. La Familia is hungry and Darlene Harris will be our waitress. We’re still gonna stiff her on the tip though when we walk the check. We are honored to have nancy mills as our chairwoman. in Allegheny county. nobody works harder. Hsrris only had five grand on Friday…guess she got lucky at the Zappala casino over the weekend and won enough to get on the ballot. Allegheny has no power. Our Chair is a cocktail democrat. 2016 big Allegheny endorsement for Katie. Only county in the state to win for Fetterman. We support Non-recommended candidates. We support candidates who permit children to be harmed. Kingdom of Cutthroat back stabbing democrats. Mayor Peduto has served us well. But he isn’t one of them. Isn’t this the county where you have to put down a deposit to be considered for an endorsement?